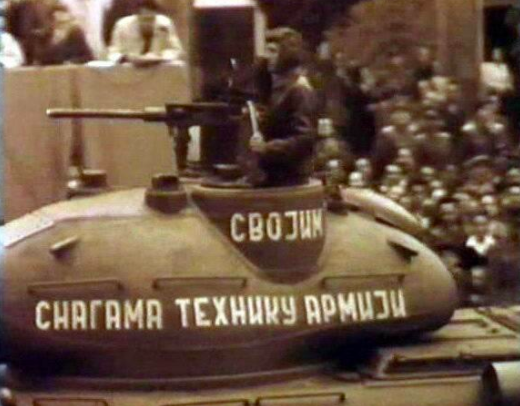 An interesting and somewhat unusual story states, that on the 26th of February 1949, while visiting the ’Petar Drapšin’ (Петар Драпшин) tank workshop, Yugoslav President Tito (Josif Broz) asked all the gathered workers if they could build a tank? Everyone answered aloud ‘we can comrade Tito!’ Tito allegedly replied something along the lines of ‘Then you have a task now!’ and so the work on the Vehicle A started. Whether this is the whole truth or just a myth, it’s hard to say. Even if true, it was a more or less a symbolic gesture, because the decision to start the production of Vehicle A had already been made in 1948. After Tito’s famous ‘No’ reply to Stalin’s demand for Yugoslavia to join the newly formed Communist Eastern Block in 1948 (the so-called Tito-Stalin split), Yugoslavia found itself in a major political and military crisis. As a consequence, this forced Yugoslavia to turn politically more and more to the west. This would result in a slightly ‘liberal’ variant of communism in contrast to the Eastern Block. That lead Yugoslavia to become the Socialist Federal Republic of Yugoslavia. It was one of the better economies in Eastern Europe during the 60’s and 70’s, with much better living conditions in comparison with other communist countries. As for the more important military crisis, the Yugoslav People’s Army (JNA- Jugoslovenska Narodna Armija) found itself in a very serious situation. The army was in the process of reorganization and rearmament and was heavily dependent on Soviet military supplies. The problem also resided in the fact that the Western allies refused to deliver any military support to communist countries. This later changed as Yugoslavia became more friendly to the Western countries, which started sending large amounts of military aid. But, in the meantime, the Yugoslav People’s Army had to find a way out of this crisis. The armored forces mostly consisted of old and captured (and also supplied by Allies and Soviets) equipment. One way to solve this problem was to build domestic tanks, which is what the Yugoslav People’s Army did. During 1948, a special commission was formed to examine the tactical and technical characteristics for the future domestic build tank, named ‘Vehicle A’ (Возило А) sometimes also called ‘Type A’ (Tип A). The Yugoslav designers had two dilemmas: should they improve the characteristics of the already existing T-34-85 Soviet tanks or design and build a brand new tank? The construction of a new tank required a developed industry and also a high number of educated and qualified personnel and, perhaps most importantly, it would take a long time to complete the implementation and the production. Due to the bad economic situation, mostly due to the damage done to the industry and infrastructure during the war, production of a new tank was not realistic or possible in the near future. As a result of this, the special commission proposed a plan to improve the T-34/85 tank. The first proposals regarding the new tank were: better armor, weight of about 28 tons, smaller dimensions, and stronger gun or the improvement of the characteristics of the already existing gun. Three workshops were selected to work on the new Vehicle A project. These were Petar Drapšin from Mladenovac (Младеновац), ‘Đuro Đaković’ from Slavonski Brod (Славонски брод) and Institut no.11 from Kragujevac (Крагујевац). Although the Petar Drapšin workshop received an order for the production of the first 5 prototypes, due to the complexity of the task, other workshops were later included. Workshop Petar Drapšin was formed on the 8th of August 1949 in Mladenovac (Serbia). It was named after Yugoslav Partisan commander Petar Drapšin (1914 – 1945). This workshop had at first some 200 workers, but this number was increased to 400 (later even more) due to an increase in production and repairs of tanks and tank parts for the T-34 and SU-76 self-propelled gun. The head of this project was Major Anton Kurt. During the war, he worked on the Stuart M3A3 conversions using German weapons. It was unusual that the new tank was built without previous project plans, as opposed to how such an endeavor usually progressed (first the designers work on plans and calculations, and then proceed to production). This was to have great (and negative) consequences in the late development of this tank. The first thing done was to have the workers disassemble one T-34 tank into parts, and then start to copy them, but without testing the material or even to do more detailed analysis of them. The lack of some metals (especially nickel) forced them to find alternative materials to be used as an improvised solution to this problem. After the list with the necessary parts was ready, the production of the new modified parts began in several different workshops. The whole tank was later assembled in the Petar Drapšin workshop. The main armament was supplied by the ‘Red Star’ (Crvena Zvezda) workshop from Kragujevac. An interesting fact is that the engine was designed by a lone soldier from the town of Bihać. The turret and the rest of the tank body was mostly made in the Đuro Đaković workshop. As previously noted, the final assembly was done in Petar Drapšin when all the parts had arrived. After 14 months of hard labor working in two shifts (more than 14 hours per day), five prototypes of Vehicle A were ready to be tested. The first tests were conducted at the foot of Mount Majdan (Мајдан) near the Capital, Belgrade. The next trials were conducted with three tanks in the region of Mladenovac-Aranđelovac-Topola. The other two vehicles were used for testing of the gun. 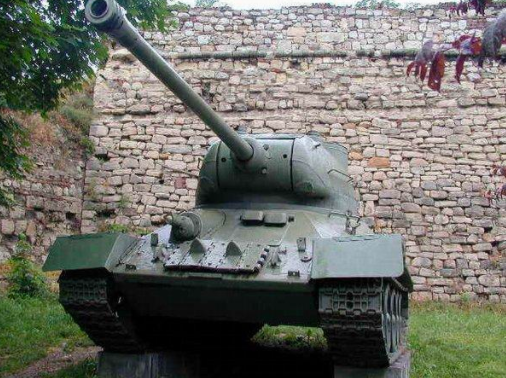 This tank was based on the T-34/85, so it is no surprise that it shared a lot of similarities with the Soviet vehicle in almost all aspects (armor, gun, running gear etc.). The interior and the crew positions of Tank A were almost identical to the T-34. The driver was located on the left side, while the radio operator, who was also the machine gunner, (the radio used was the British SET-19WF with an operational range of 10-15 km) was on the right side of the hull. In the tank turret there were a commander, the gun operator and the loader. To gain access to their battle positions, the crew had two ways of entering the tank, through two hatch doors on the turret roof or through the hatch door on the front hull armor (same as the T-34). As well as the driver’s view hatch slides, two periscopes were located on top of the turret and used for observation. The main armament was the Soviet 85mm ZIS-53 gun with some minor modifications done on it such as improved hydraulics and adding a muzzle brake although the original Soviet ammunition was still used. Fifty rounds of ammunition for the main gun were carried inside Vehicle A. The original Soviet TS-15 sight device was exchanged with the German TZF one (taken from captured Pz.Kpfw.IV tanks) with an improved magnification x4 instead of x3. The maximum elevation of the main gun was -10° to +17°. The secondary weapons were also changed. The Soviet DTM (7.62mm) machine guns were abandoned and, instead, two MG 42’s (7.92mm) were installed (one in the hull and one in the turret). A third, heavy machine gun (Browning 12.7mm) was installed on the roof of the turret, to be used for light anti-aircraft role. The frontal armor thickness was 50mm (at an angle of 30°), while the angled front hull corners, sides, and the rear armor was 45mm thick. The hull roof and floor armor were similar (20-25mm). The turret was elliptical-shaped with frontal thickness of around 100mm, with the side 82-86mm and the rear 60mm. The tank turret was narrower but higher than the original T-34 one. A new 500 hp V2 diesel (12-cylinder) engine was installed. This engine was mostly built from domestic parts, but the materials used to build it were of low quality, which affected the engine performance and caused many overheating problems. The running gear was identical to the T-34. There were a lot of problems with the transmission, as it was bumpy and unreliable. The tracks were 50 cm wide and weighed more than the Soviet ones. The Vehicle A was never used in any combat operations. 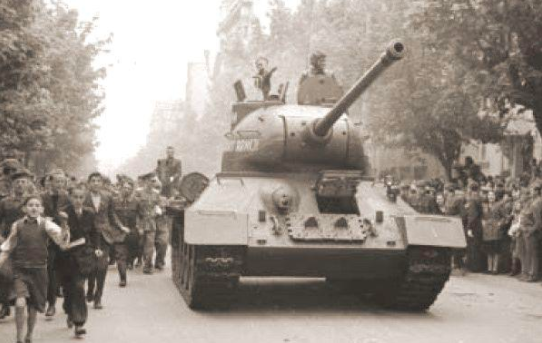 They were first shown to the public at a military parade held in Belgrade on the 1st of May 1950. After that, they were used for a limited time for testing and crew training. Only five were ever built, simply because the entire production was too slow and too expensive, and because foreign armored vehicles had become available in sufficient quantities for use. A more damning reason for the rejection of this project lies in the very way in which these tanks were built. Although several vehicles were made, each of them was a unique vehicle. Because there were no design plans or calculations, each of the five tanks was built in a unique way with some differences in production (like the materials used, tonnage etc.). So, when the Yugoslav Army field tested these vehicles, it was not possible to make an accurate conclusion as to whether they were successful or not. They could not be considered as prototype vehicles for the possible future production and in order to get any useful information, it was necessary to produce several more vehicles, which was too expensive. Others problems were that the Vehicle A was a few tons heavier than it was originally planned, the height and width did not meet the specifications and there were too many breakdowns during testing. Generally speaking, Vehicle A did not offer any better performance than the T-34. The final decision was made to quit the development of this project. The order for 10 more vehicles planned was canceled. Despite the cancellations of the Vehicle A project, experiments on improving the T-34 continued for some time after that. At the beginning of March 1952, one vehicle was sent to the Kalemegdan Military museum in Belgrade, the capital city of Serbia, where it is still located and can be seen. A second vehicle was supposed to be placed in the Petar Drapšin workshop (fate unknown). Two turrets were put on display in front of the workshop Đuro Đaković. The rest were initially used for testing and training, but most ended as firing targets. Artillery and Armoured vehicles in exterior of military museum, Mirko Peković i Ivan Mijatović, Vojni muzej Beograd 2009. Many thanks for this article !! Is there any chance to gain enough information for an article for the yugoslavian sherman modification SO-122 with the 122mm A-19 and the M636 Condor ? An article on the SO-122 is currently in progress. There are no immediate plans for the M636 at this time. I thought this tank was classified as a Heavy Tank? -NOTE: I have not yet read the article.